Germinated brown rice (GBR) contains rich bio-active components, but has poor edible quality. 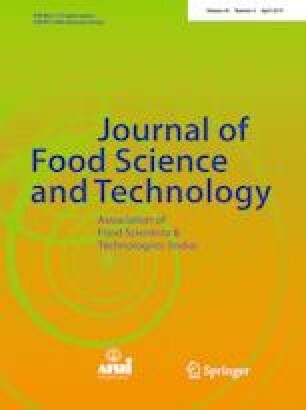 To improve the cooking quality of GBR, fissure generation in kernels caused by microwave drying were investigated considering cooking properties, microstructure and textural attributes. The microwave intensity had significant effects on the fissure percentage of GBR, and microwave intensity of 3–4 W/g may be suitable for the microwave drying of GBR based on the distribution of fissure percentage for the GBR. The fissures of GBR caused by microwave drying provided the suitable penetration routes of water into GBR kernel. Appropriate fissure amount in range of 3–4 in GBR kernels were conducive to increase its cooking quality and rice taste due to the moderate water absorption and starch gelatinization. The results present a new viewpoint from the perspective of fissures inside grain kernels to evaluate the drying quality of cereal materials such as GBR. The authors gratefully thank the financial support provided by the National Natural Science Foundation of China (31571848), National Public Welfare Industry (Agriculture) Research Project of China (201403063-4) and Science and Technology Project of Harbin in Heilongjiang Province of China (2017RAXXJ028) for this research project.